Welcome! 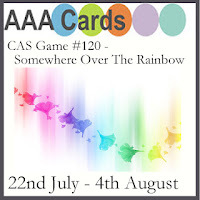 I am playing with Butterflies and Rainbow Colors using a sketch from Retro Rubber Challenge #91 to create a CAS card. I began by inking the Butterfly stamp from GKD A Year Of Borders set. 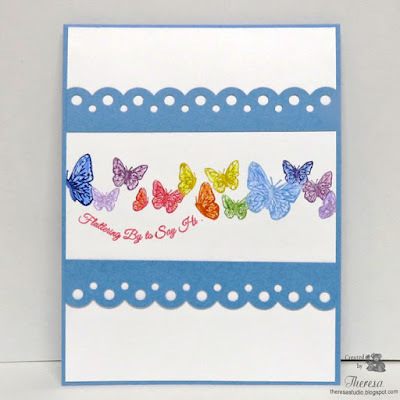 I used Memento Markers to ink the butterflies in the colors of the Rainbow and stamped on White CS and colored in the images with Colored Pencils. I stamped the older Sentiment from Papers and Such with Memento red ink. Finished with strips of blue cut with Martha Stewart Scallop Dot Punch and a card base of the same blue. I can trace the Gina K Stamp back to 2011 and The Paper and Such sentiment to 2015 but they may be even older. 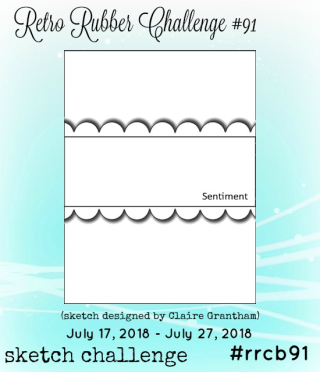 Retro Rubber: Challenge #91 Time for a Sketch. Both stamps are older that 2 years. Butterflies and rainbows! How good is that! I love the way you've stamped them by colouring the stamp then adding more colour later. It really makes that rainbow effect work well. 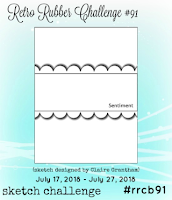 Thank you for joining in with us at Retro Rubber Challenges this week. A creative use of that border stamp! Fantastic card! Gorgeous CAS card Theresa! I love the different coloured butterflies, they are so pretty. Such a pretty array of rainbow butterflies, looks fabulous! Thanks for playing at AAA Cards. What a wonderful way to use the colors of the rainbow! I love butterflies and making them the focal point in our sketch was brilliant! Thank you for playing with us at Retro Rubber and hope you can join us again soon. 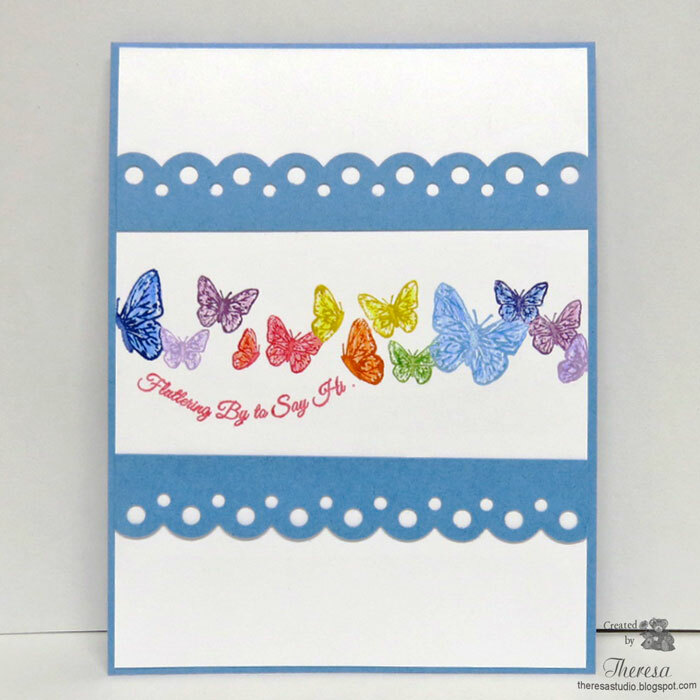 Theresa, your card is beautiful, love the butterflies and your take on the challenge! Thanks for sharing with Retro Rubber. Beautiful rainbow of butterflies, love your choice of colors. 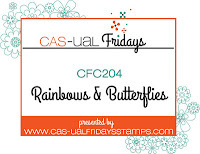 Thank you for joining CAS-ual Friday's challenge. Love the way you chose to stamp and colour the butterflies! And your layout is fantastic! Thanks for joining the CAS-ual Fridays Challenge! !